Another high quality connection that is only for running picture. This connection separates luminance and chrominance to maintain a high quality picture. 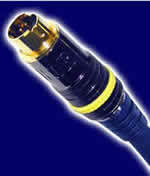 Will also drive long runs of cable (10M) provided the cable used is high quality and well screened. Labelled as: Either Y/C, S-Video, S-VHS or AV1/2/3 (need to check via set-up menu). Almost all players have s-video output. Connect either directly to a TV or to an AV receiver that can switch s-video. S-VHS interconnect differs from composite in that it carries the brightness (luminance, or Y) and colour (chrominance, or C) signals on separate lines within the same interconnect. Every TV has a Y/C separator built in, but using the S-VHS connection bypasses the TV's Y/C separator. You should use the S-VHS connection if your source device (such as a VCR or DVD player) has a better Y/C separator than your TV. How do you tell which component - the TV or the source device - has a better Y/C separator? To start with, assume that any device that creates separate Y and C signals from the start has good Y/C separation. With these devices, you should always use an S-VHS connection if your TV has one. How to Choose the Right S-VHS Connection If Your TV Has One. DVDs contain a composite video signal that must be separated inside the DVD player to produce an S-VHS output. The only way you can tell whether you should use composite or S-VHS connections here is to test them yourself. Connect an S-VHS interconnect from the DVD player to your TV's video input 1, and a composite interconnect from the DVD player to video input 2. Now switch between the inputs to see which looks best. S-VHS and Hi8 VCRs can produce perfect Y/C separation, if the signals on the tape were recorded from a cleanly separated source. The VCR must separate the Y and C to record tapes off the air, and it usually does only a fair job. Some prerecorded tapes are produced with excellent Y/C separation, some aren't. If you have a TV with a good Y/C separator, using the S-VHS connection with one of these VCRs will only sometimes produce a better picture. If your TV's Y/C separator isn't very good, though-if you see dot crawl and hanging dots on network TV shows, for example-you're almost always better off using an S-VHS connection with these VCRs. Remember that the component video signal is split into three parts; black and white information (Y), and two colour difference signals (Pb and Pr). The S-Video connection keeps the all-important black and white (Y) information separate, and combines the colour difference signals into a single colour signal (C). Instead of three separate signals going to the display device, there are now two separate signals. As you would expect, combining the two colour signals results in a degradation of the colour information. In the grand scheme of things, this is a fairly minor degradation, and you still get an exceptionally good picture from this signal.